Announcement Hello, and welcome to Beach Baubles™! 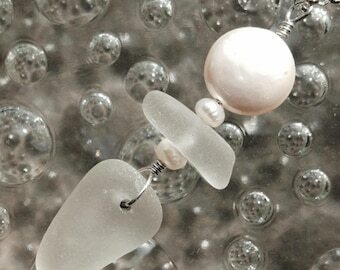 I'm always busy in my home studio,creating tidal treasures for beach lovers to enjoy! These treasures are made from genuine sea glass,also known as beach glass or Mermaid's Tears,seashells,sea pottery/china shards, and beach stones. Some of these are personally collected by me on the beaches in my area,and some I have gotten from other collectors from around the world.It's amazing how different sea glass is from all the different coasts! I love it all! Among the products I create are: accessories such as keychains,tie tacks,hairpins and cell phone charms; jewelry such as earrings, necklaces,chokers,bracelets and anklets;home decor items such as ceiling fan/light pulls, wine glass charms,suncatchers and wind chimes, and holiday ornaments. Hope you enjoy your visit! Hello, and welcome to Beach Baubles™! I'm always busy in my home studio,creating tidal treasures for beach lovers to enjoy! These treasures are made from genuine sea glass,also known as beach glass or Mermaid's Tears,seashells,sea pottery/china shards, and beach stones. Some of these are personally collected by me on the beaches in my area,and some I have gotten from other collectors from around the world.It's amazing how different sea glass is from all the different coasts! I love it all! Among the products I create are: accessories such as keychains,tie tacks,hairpins and cell phone charms; jewelry such as earrings, necklaces,chokers,bracelets and anklets;home decor items such as ceiling fan/light pulls, wine glass charms,suncatchers and wind chimes, and holiday ornaments. Hope you enjoy your visit! 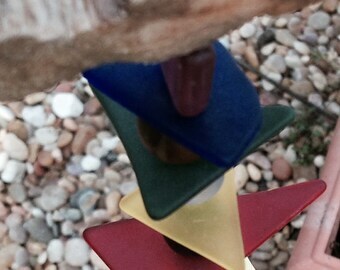 Beautiful little wind chime! The seller has been great to work with!! Exactly as pictured. Shipped quickly. Even made them semi clear by rubbing oil into them scented with patchouli.